First of all, I want to strongly advise you to sign up for The New York Times Open Thread newsletter—it's sent out every Friday afternoon and is an excellent recap of the week in fashion news. 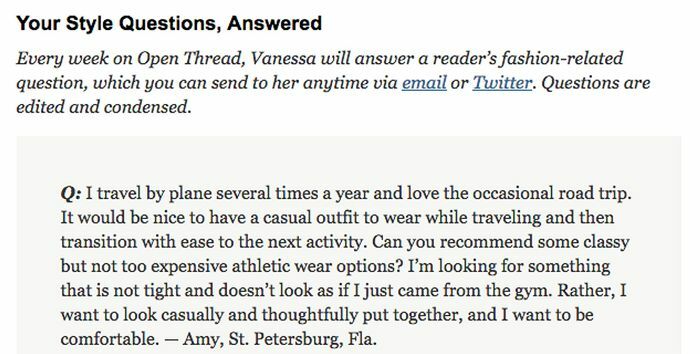 I'm always sure to scroll to the bottom of the newsletter, as it's where the fashion director, Vanessa Friedman, thoroughly answers readers' most burning style questions. She's one of the most trusted voices in the industry, and you should take whatever advice she has to offer. She typically chooses questions whose topics will undoubtedly benefit other readers as well, like travel clothes. For last week's edition, Friedman was asked for some "classy but not too expensive athletic wear options" to wear on flights and her next activity upon arrival. In response, she named several specific basics that she recommends for travel. Included were polished cashmere pieces, ankle-length pants, Anthropologie pullovers, and a wrap dress. All of her recommendations are a welcome departure from leggings and hoodies and would work just as well off the plane as they do on. Keep scrolling to read Friedman's advice from the latest Open Thread newsletter and shop the pieces she recommends. Next up, 10 "boring" basics French women always have handy.